Home / Blogs / From the Virtual Terminal / Are You Feeding the Appetite for Precision Adoption? We’ve all heard about the next-generation gadgets and concepts which will revolutionize farming. But there are current technologies which farmers are looking to add, which means dealers have an opportunity to capitalize on as we head into the second quarter of the calendar year. Respondents to the recently released 11th annual No-Till Farmer Operational Benchmark Study, forecast increased adoption of 11 different precision technologies in 2019, compared to last year. The biggest mover being variable-rate fertilizing, up more than 10% from 2018 to 45.1%, followed by use of satellite aerial imagery, up more than 9% year-over-year to 27%. Results of the 11th annual No-Till Farmer Operational Benchmark Study show that no-tillers forecast increased adoption of 11 different precision technologies in 2019, compared to last year. Click here for full-size image. Also up more than 7% are auto-seed shutoff to 46.1% and yield monitor and data analysis to 56.2%. While only 12.1% of respondents plan to utilize implement guidance, it’s nearly double the 2018 percentage. Two other emerging technologies trending upward are unmanned aerial vehicles at 14.9% and variable-rate seeding at 32.2%, with both seeing expected adoption growth of nearly 5%, according to the study. 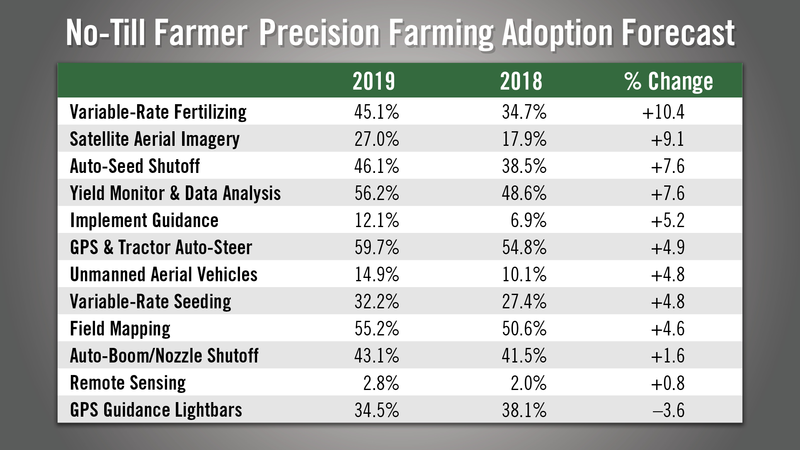 So how do the broader adoption of precision practices correlate to no-tillers’ expected technology purchases in 2019? The benchmark study revealed that on average, respondents are planning to invest about $2,600 per farm on ag technology.